Deze ruime duplex is gelegen in een tropisch paradijs. De woning is op 11th Street, op het oosten, op het eiland stad van Key Colony Beach MM 54 in het Midden-Keys (de buurt van Marathon). Dit is een kanaal-front unit met een 37-voet dock, vis schoonmaken tafel met licht, en gemakkelijke toegang tot zowel de Atlantische Oceaan en de Golf van Mexico. Het huis beschikt over een nieuwe, grote 29-foot afgeschermde veranda tegenover het kanaal (geweldige plek om te dineren), twee slaapkamers, twee badkamers, grote kamer, carport en wasruimte. De slaapkamer heeft een kingsize bed en de slaapkamer heeft twee tweepersoonsbedden. Elke slaapkamer heeft een eigen badkamer. De unit is gerenoveerd met een nieuwe keuken, nieuwe baden, comfortabele meubels / bedden, centrale lucht en warmte en betegelde vloeren. Lidmaatschap van een privé-strand aan de Atlantische Oceaan met vers water douche en picknickplaats is inbegrepen. Het strand ligt op vijf minuten lopen van de eenheid, zoals is Sunset Park. Strandstoelen en handdoeken. FIETSEN, WiFi en drie flatscreen-tv's zijn inbegrepen. Key Colony Beach is een eiland stad die een rustige, tropische omgeving biedt uitstekende restaurants, bootverhuur, charter boten, par drie golf, tennis, basketbal, speeltuin, en resort-type winkelen allemaal op loopafstand. In combinatie met onze vernieuwde unit, dit een winnende vakantie locatie. Dit is een rookvrij en huisdier-vrij huis. It was our first time at Fran's place and we were so glad we decided for this vacation home. Not only an immaculate and very clean house but also very comfortable and cosy to spend your vaccation. We really enjoyed the the house, the screened porch and the so well equiped kitchen. It was so easy to come home after a long day out and prepare our own meal. We enjoyed to have our first cup of coffee in the morning under the coconut palm trees. The boys loved fishing in the canal and watching the nurse sharks, eagle ray and parrot fish passing by frequently. A big heron also visited us regularly. We really enjoyed the use of the five provided bikes to cycle quickly to inch beach. Not only the house is a "gem", also the central location of it with easy access to both the upper/lower Keys.We went on several trips in the Keys, but the most fascinating trip was a snorkeling tour to the reef on Looe Key. On a calm day with really good visibility we were able to snorkel with grey reef sharks, 2 giant eagle rays, nurse sharks, a stingray, a big grouper and barracudas. The boys also spotted a lobster, a green murray, a blowfish, dolphins and of course lots of colourful tropical fish. Really fascinating. Well, unfortunatelly after two weeks our vaccation came to an end, but if we ever make a trip back to the Keys we would only stay at "Fran's place". We stayed at Fran’s Place during the first week of lobster season this year and it was our first time renting in Key Colony. Fran warned us that certain aspects of the house wouldn’t be completely finished after hurricane renovations, so we weren’t sure what to expect….It was immaculate! The house was beautiful, comfortable, and very accommodating. Fran replies to her email very quickly and was so nice to let us check in early to beat the lines at the boat launch. We also met the neighbors (locals) on both sides of the house and they had nothing but great things to say about Fran and the home. We would definitely love to come back and stay here again. Thank you Fran!!! Everything you need for a fantastic vacation! 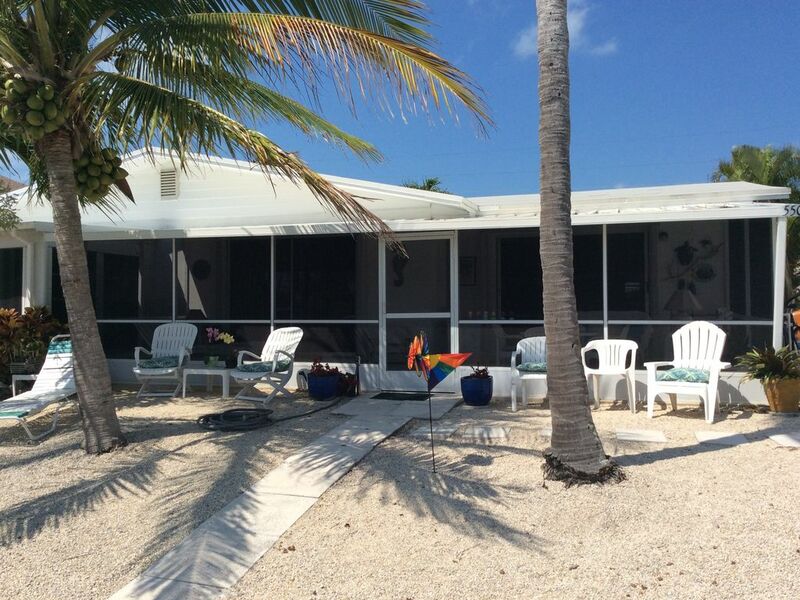 The house was well equipped, cozy and perfect for a vacation in the keys. We couldn't have asked for a better place to stay or a better owner. This was our third stay at Fran’s Place. We are so glad she was able to rebuild after Irma & open her home. The house is comfortable, all kitchen amenities are provided, & it’s canal access is perfect for our boat. So many good restrurants close by! I would return to Frans Place in the future.The owner was a great host.Thank you for making our stay in your home most comfortable.The boat dock and the ability to store our boat trailer was important.We socialized outside while cooking on the grills,very nice area.We enjoyed the view from the living room overlooking canal.The private beach was good.The neighborhood accommodates vacationers.I don't have any negative comments.Thanks again Fran. Fran's Place was just perfect for our family of four. The canal outside the house was a perfect place for fishing and viewing all kinds of fish. We saw snapper, nurse shark, butterflyfish, parrotfish, and many more species. The iguana on inch beach and in the yard were a surprise. The house was spotless and very comfortable. Everything was there we could possibly need, and more! Thank you, Fran for an unforgettable vacation. We hope to visit again one day. Lobster weeks - $1250 plus 12.5% FL Taxes Refundable security deposit holds reservation with a signed rental agreement.